We’re a few weeks removed from America’s most significant singular sporting event of the year (Popularity, revenue, viewership, etc.) – the Super Bowl. The Super Bowl, revolving around the sport of football, uncharacteristically lived up to the hype and the glitz and glamour surrounding the event. Question begs me to ponder, what would be boxing’s Super Bowl? In recent history, Floyd Mayweather typically occupied the role as one of the participants or the main participant in the annual Super Bowl – or boxing’s Mega Event, if not sporting event of the year. Dating back to the year 2007, as long as Mayweather was an active fighter, as there were stretches of inactivity (brief retirements), he was a key component in the major events of the year. In 2007, Mayweather served as B-Side to Oscar De La Hoya in their “Dream Match,” and returned from brief retirement to face Juan Manuel Marquez as the A-Side in 2009. Mayweather continued his trend of Mega Event Headliner in May of 2010, facing Shane Mosley and fighting the once thought of future torch bearer for boxing, Victor Ortiz in September of 2011. Miguel Cotto, Saul “Canelo” Alvarez, Marcos Maidana would follow in subsequent years, capped off with Manny Pacquiao in 2015 and against MMA star Conor McGregor in a crossover event in 2017. 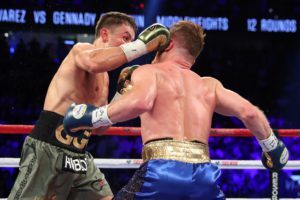 It can be debated Alvarez vs. Gennady Golovkin was boxing’s Super Bowl of 2017 and it can be argued Alvarez participated in boxing’s Super Bowl for 2016, as he demolished Amir Khan in six rounds. The match-ups featuring pound-for-pound fighters Sergey Kovalev and Andre Ward or top welterweights Keith Thurman and Shawn Porter from an entertainment and significance perspective can be considered for boxing Super Bowl contention for 2016, but lack the overall metric success for consumer awareness and revenue generated. The reason Mayweather essentially participated in boxing’s Super Bowls over the course of this past decade is due to an assortment of factors. The fights for one, in spite of the entertainment value for the casual fan, are an actual event. The fight is discussed across various brands and platforms of media sports and pop culture. Much like Mike Tyson, more than a decade prior to Mayweather’s rise to prominence from a popularity standpoint, his fights or events are talked about by the common/casual person. The fights drew large numbers viewership/Pay-Per-View wise, generated much revenue and made everyone involved from a fight/promotional/marketing/sponsorship standpoint a lot of money. The records Mayweather set from a financial perspective are well documented. According to multiple reports, Mayweather generated approximately 23.8 million in PPV buys and $1.67 billion in revenue throughout his career while breaking and setting numerous records in the process. Who will headline boxing’s Super Bowl for 2018? Strong candidate and the obvious pick is the rematch between Alvarez and Golovkin. The first match resulted in what was considered a controversial draw; however the draw is a fair assessment of the fight due to varying factors. Scoring a round can be subjective as each judge, each viewer, has their unique way of scoring. There is a 10 point scoring system; however with criteria such as ring generalship, defense, effective aggression, effective punching, actual punches landed, etc., scoring can be subjected as mentioned. Their initial encounter provided much excitement, entertainment and was an excellent event from a purist’s standpoint as well. The event itself generated one of the highest gates in Nevada history and tallied excellent Pay-Per-View numbers. Expect the same result from a numbers perspective for the rematch. One of the biggest match-ups discussed within the boxing community is Errol Spence vs. Keith Thurman. Widely regarded as one of boxing’s best prospects, Spence realized his dream last year capturing a world title by dethroning IBF welterweight champion Kell Brook in a compelling contest in Brook’s backyard in the United Kingdom. Spence wants to unify the welterweight division, Thurman currently possesses the WBC and WBA titles and this is a fight between two undefeated champions in their physical primes. According to Spence, the fight against Thurman is a bout he has envisioned for more than three years now. For his part, Thurman insists the eventual proposed bout will occur but when the time is right. Thurman is recovering from an elbow injury and is scheduled to return in May for his comeback fight after more than a year of inactivity. The unified champ would like another bout towards the end of the year before taking on Spence – which would effectively push their potential match back to 2019. Former unified two-division world champion Terence Crawford is also mentioned as a potential opponent for either Thurman or Spence, as he recently moved to welterweight, but the fight between Thurman and Spence must commence first. Crawford for the last couple of years was mentioned with fighting the likes of Manny Pacquiao (who appears to be avoiding Crawford) and oddly enough, Crawford recently ranted about the constant, unbridled praise received by one of boxing’s best pound-for-pound fighters Vasyl Lomachenko. Instead of Crawford landing either fighter, Pacquiao and Lomachenko are rumored to be on a collision course towards the end of this year. Pacquiao and Lomachenko could potentially be a large event if properly promoted and dependent on upcoming performances from the pair in build up towards the rumored event towards the end of the year. There could be much interest internationally as Lomachenko has a large Ukrainian and eastern European audience and Pacquiao has an obvious large following from his home country the Philippines. This pairing features a former pound-for-pound king vs. someone considered by many as one of the best pound-for-pound fighters today. Another dark horse for Super Bowl is unification bout taking place in the heavyweight division between Deontay Wilder and Anthony Joshua. Although unlikely to happen this year due to promotional issues and depending who you ask – unwillingness on the part of one party. Both Wilder and Joshua have tough tests ahead of them that cannot be taken lightly. Wilder has to deal with arguably one of the most avoided fighters, undefeated Luis Ortiz. Joshua has to deal with another titlist in the division, Joseph Parker. All four fighters are undefeated, highly skilled with their own definitive style, and as we say in boxing especially in the heavyweight division, one punch can change everything. There’s no telling with certainty what will happen. If Mayweather is serious with his recent hints of entering the Octagon with the UFC then his probable rematch with McGregor or debut against former WWE star CM Punk could potentially steal the spot. I know technically if either match-up were to occur, it’s not a boxing match, but it would involve one of boxing’s most accomplished and valued prizefighters and would undoubtedly be one of the biggest sporting events of the year. Because love him or hate him, Mayweather draws attention, can be controversial and he knows what sells. So who will feature in boxing’s Super Bowl of 2018?